These 20" super soft Champagne floor burnishing pads will polish a finished floor to a high shine in no time! These pads have a removable center hole and are typically used on 20" burnishers like the CleanFreak® 20" electric floor burnisher, and the Minuteman Lumina 20" battery powered burnisher. Each pad is 1" thick, has a removable center hole, is manufactured in an open weave (non-clogging) design, and is manufactured from 100% recycled materials. The softness of the Champagne pads produces the best shine possible on your commercially tiled floors. For best results, use on soft to medium floor finishes. 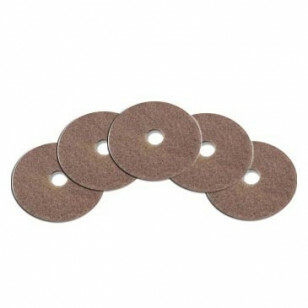 Please feel free t to take a look at our complete line of high speed burnishing pads for other options. We carry many different sizes and styles for you to choose from.